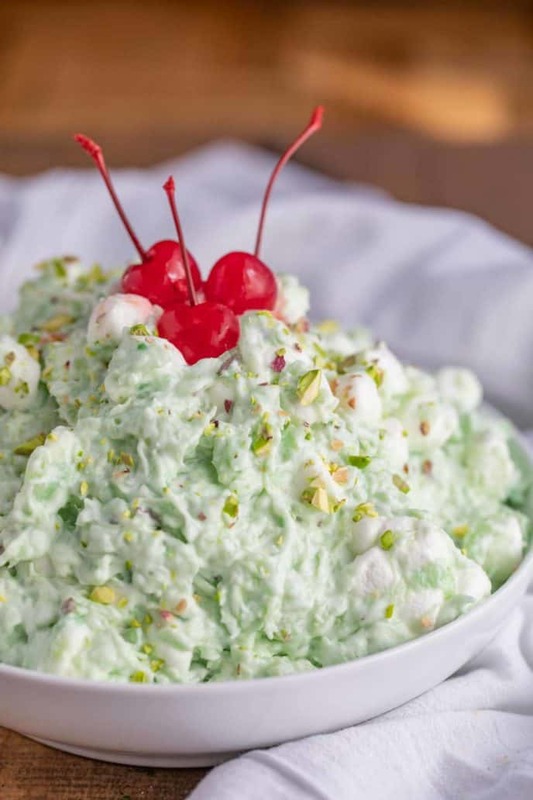 Watergate Salad (Pistachio Delight) is a sweet and crunchy no-bake dessert made with just 5 ingredients like marshmallows and pistachio pudding, topped with chopped nuts and maraschino cherries! 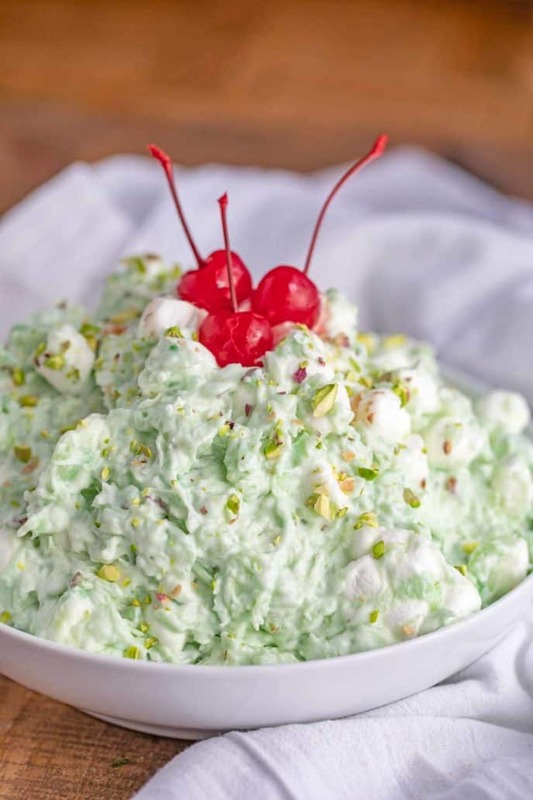 Old-Fashioned desserts like Homemade Turtle Candies, Pound Cake and Macaroons are a favorite around our house and this Watergate salad is a huge hit for us with the spring coming up around the corner (thanks groundhog for not seeing your shadow!). 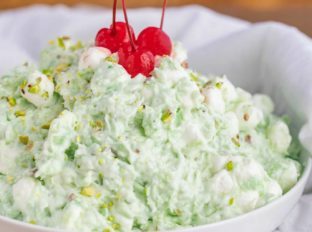 Watergate Salad (Pistachio Delight) is a simple dessert salad made from pistachio pudding mixed with crushed pineapple, cool whip, mini marshmallows, and chopped pecans. I like to top this with my easy whipped cream and maraschino cherries with an extra handful of chopped nuts. I can’t say I was a huge fan of the salad as a kid as my mom never used to let us get away with marshmallows and cool whip but when I was in college a friend made it for a election party I was attending. It was a fun recipe I recreated a few times, both fully homemade with my Homemade Cool Whip and Homemade Marshmallows and sometimes semi-homemade with just the homemade cool whip or even swapping out with homemade whipped cream in place of the homemade cool whip. The real crux of the favors you’re looking for here in this salad is the crushed pineapple with the pistachio pudding mix. 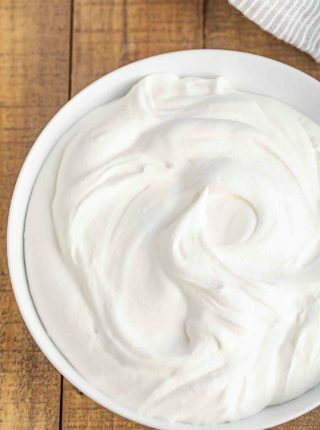 Whether you choose to use a fresh whipped cream or a cool whip you can make either work with some careful planning. If you prefer a more natural route I would be much much more careful about how long you let this recipe sit out. Cool whip is a stabilized product whether you make my recipe or you use the pre-made variety. A fresh made whipped cream will taste delicious fresh from the fridge but will soon fall and melt. 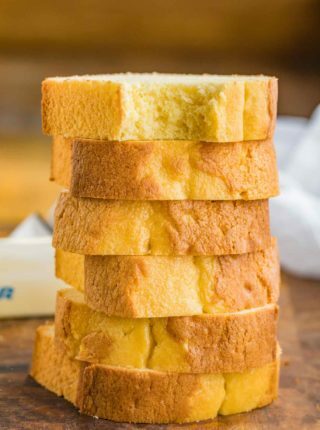 So if you’re looking to create a more homemade version take care to serve it immediately. 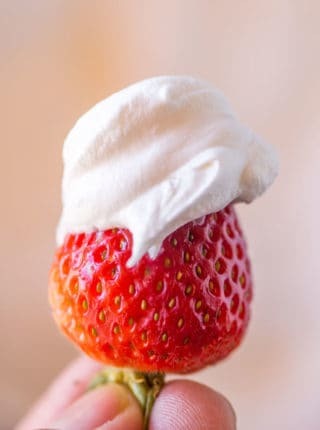 I would personally make the whipped cream, refrigerate until you make this recipe then freeze the recipe for 20 minutes before serving to keep it as cold as possible. This salad has a really nice light green color, which is why it’s also called the “green stuff” or “pistachio fluff”. It’s perfect for Easter or St. Patrick’s day parties. You can turn this into a kid-friendly activity by making my homemade marshmallows first, then using them for this salad recipe! HOW LONG DOES WATERGATE SALAD KEEP? Watergate salad will last in the refrigerator for 1-2 days. Cover the salad tightly with plastic wrap to keep it from drying out. CAN YOU FREEZE WATERGATE SALAD? You can freeze watergate salad for up to 3 months. Freeze in popsicle molds to make watergate popsicles, or spread in a baking dish and scoop it like ice cream. WHAT IS THE HISTORY OF WATERGATE SALAD? 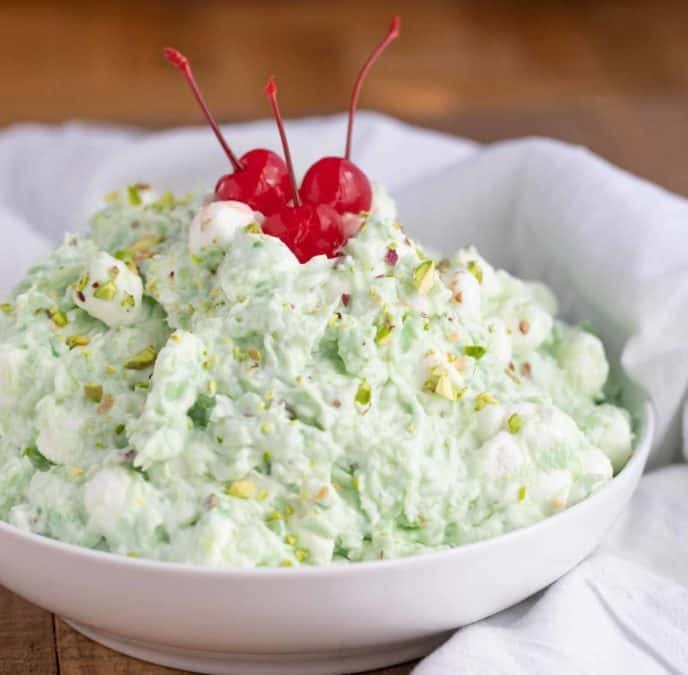 Watergate Salad was initially made by Kraft in the 1975 as a promotional recipe for their new pudding called Pistachio Pineapple Delight, rewritten and renamed by the media over time. The name “Watergate Salad” was originally coined by a columnist in Chicago, named for the presidential Watergate hotel scandal. The name just stuck, and now this is a popular salad for potlucks and parties across the country. You can add other toppings to this salad like mini chocolate chips, walnuts, shredded coconut, crushed pistachios, or sliced bananas. Add the toppings right before serving. You can eat this dessert right away if you can’t wait, but I recommend the chilling step because it helps the pudding fully set, and it just tastes better cold. Ideally, make this the night before and let it set in the refrigerator overnight. Make this watergate salad recipe with half pudding mix and half low fat cool whip to lighten up this recipe. You can also make it more indulgent by mixing half cream cheese (or cottage cheese) with half whipped cream, then adding the pistachio pudding mix. Serve watergate salad in a graham cracker crust to make a pistachio pie. Don’t drain the pineapple, it’s the juice from the can that turns the dry pudding mix into pudding. If you’ve accidentally drained it, add some water (or pineapple juice if you have it), according to the pudding mix directions. Watergate salad calls for pistachio pudding mix, but you could technically use this recipe with any flavor of pudding mix for a quick dessert. Try chocolate for a chocolate-pineapple dessert, or coconut for a pina colada version. Use canned pineapple in water or juice, not syrup. The syrup will be too thick and won’t work with the pudding mix as well as the juice, and the salad will turn out too sweet. In a large bowl mix the pudding mix, pineapple, marshmallows and pecans well then add in the cool whip gently. 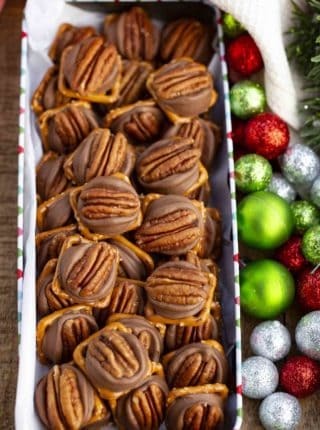 Refrigerate for at least one hour and garnish with chopped nuts and maraschino cherry if desired. This is one of my all time favorite picnic salads!!! Love this classic! Always reminds me of my childhood. 🙂 YUM! This was so good!! My kids loved it! So glad you here, Toni! My Mom use to make something super similar to this and it was one of my favorites – I need to make this for my kids! We used to have this all the time as a kid…. and somehow noone had kept the recipe. Thanks for sharing it! The pineapple juiciness and the crunch of pistachios …. yep! Dreamy wonderful! My mom makes something similiar so this dish always reminds me of home! It’s one of my favs.